Shirley Jackson’s short story “The Lottery” continues to thrill and unsettle readers nearly seven decades after it was first published. By turns puzzling and harrowing, “The Lottery” raises troubling questions about conformity, tradition, and the ritualized violence that may haunt even the most bucolic, peaceful village. This graphic adaptation by Jackson’s grandson Miles Hyman allows readers to experience “The Lottery” as never before, or to discover it anew. He has crafted an eerie vision of the hamlet where the tale unfolds and the unforgettable ritual its inhabitants set into motion. Hyman’s full-color, meticulously detailed panels create a noirish atmosphere that adds a new dimension of dread to the original story. 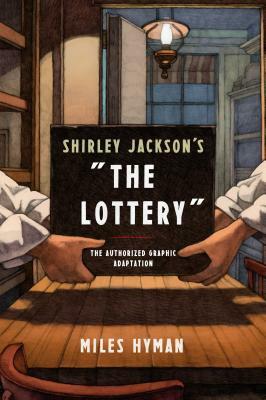 Shirley Jackson’s “The Lottery”: The Authorized Graphic Adaptation stands as a tribute to Jackson, and reenvisions her iconic story as a striking visual narrative. Miles Hyman is an artist who specializes in graphic novels and adaptations of classic literature. His work has been shown in galleries around the world and has appeared in publications such as The New Yorker, The New York Times, and GQ. He is the grandson of Shirley Jackson. He lives in Paris.